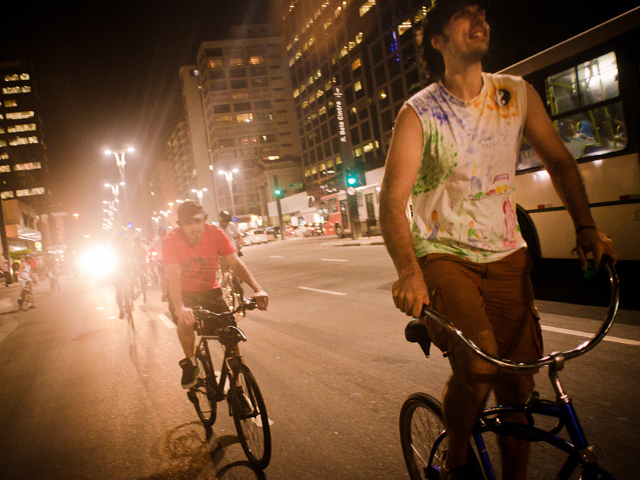 Two cities in Brazil have turned to the internet to improve cyclist safety. Photo by Fora do Eixo. One of the best modes of transport for a sustainable world – one that offers health benefits, increased mobility, and reduces pollution – is too often sidelined, ignored, or downright dangerous to ride. Of course, we’re referring to the bicycle. While traditional solutions to bicycle safety issues have focused on better road design and changes to the built environment, a few Brazilian cities have found another way to increase bicycle safety: the Internet. Collaborative websites for the cities of Porto Alegre and Rio de Janeiro have sprung up to help protect cyclists on the road by providing crowd sourced, up-to-the-minute data and alerts. Lucas Panitz, a geographer and researcher at the Federal University of Rio Grande do Sul (UFRGS) in Porto Alegre, is the creator and designer of “Bike Crimes POA”, a collaborative tool that allows users in Porto Alegre to report road hazards, irregularities, bike thefts, and other threats to cycling safety. Among Bike Crimes’ many features is a tool which allows users to receive immediate alerts every time a report is filed within 20 kilometers of locations they specify. Panitz helped to design a similar system for the city of Rio de Janeiro. This platform, called Ciclista Na Pista (“Cyclist on the Track,”) was developed in partnership with geographer Carla Hirt, a native carioca. The idea is the same: to contribute to greater safety for bicyclists – in real time – through online reports and alerts. Both Bike Crimes and Ciclista na Pista take advantage of recent advances in open source mapping technologies and platforms, and are free to use and maintain. Both are downloadable as an app for iPhone or Android. This post was originally published in Portuguese by Luisa Zottis for TheCityFixBrasil. To read the original, visit https://thecityfixbrasil.com/2013/06/12/plataformas-online-pela-seguranca-sobre-duas-rodas/.